Towards the end of the year, Aston Martin will reveal its first ever crossover, the DBX. While the British automaker has already released photos of a camouflaged prototype getting dirty, our spies have managed to snap some photos of the interior, giving us a first look inside the DBX. It’s clearly still at an early stage of development, but the cabin appears to have plenty of Mercedes-sourced components. This isn’t surprising since the two companies have forged a partnership allowing Aston Martin to use Mercedes-sourced powertrains and technology. Looking inside, the steering wheel looks like it belongs in a Mercedes model, although the airbag and star emblem has been removed. There’s also a massive digital instrument cluster, but it remains to be seen if this will feature in the final production model. Elsewhere, the large screen appears to have the same interface as Mercedes’ advanced MBUX infotainment system, and some of the buttons around the gear shifter look like they have been sourced by Mercedes. 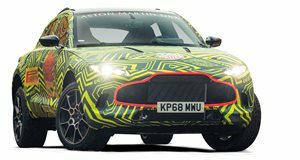 As for the exterior, no changes have been made since Aston Martin released the first official photos of the DBX last year. The crossover will still be recognizable as an Aston Martin, thanks to the familiar grille, slim headlights, and sporty proportions. It will also have a sloping roofline and a dual exhaust system, as well as "impressive multi-terrain and towing capabilities” according to Aston Martin. No powertrain details have been revealed yet, but the Aston Martin DBX crossover is expected to be powered by a Mercedes-sourced twin-turbo 4.0-liter V8 tuned to produce around 503 hp and 505 lb-ft of torque. It will most likely be paired with an eight-speed automatic transmission and a rear-biased all-wheel-drive system. The Aston Martin DBX will be unveiled in Q4 2019, but we’re expecting the automaker to release more teasers before then.